Just for reference, here I’m writing down some interesting links I’ve recently seen about quality while developing and maintaining websites. That’s enough to keep me busy for months. But these days I’m also trying ideas, using CSS3 and HTML5 features, so I’m using a lot what it could be the best website with compatibility features. Adverts are everywhere. And they try to get your focus at all prices. I hate that. Even these days, that in theory they send you proper tailored adverts matching your needs, I get annoyed… because actually you just get SPAM. Moreover, in Internet we have something that I call “soft SPAM“, that basically doesn’t sell you anything but disturb your focus. I’m speaking, for example, about the “Who to follow” block in twitter or “Recommended pages” in facebook. It might be useful when you create a new account, but it is totally disturbing in your normal live activity. · You shouldn’t use the same password in different places. · You should change your password from time to time. For example: if your usual password is “sadshoes”, and you are setting it on facebook, your new password should be “sadshoesf3” (“f” from facebook and “3” from 2013). This will be far more stronger than just “sadshoes”, and if somebody breaks your password, he will only be able to enter in facebook. This will also force you to change your password every year. · Do not think that somebody will try “manually” to break your password; nowadays a bot will try to break your password using a long list of common words used as passwords. · Never use pure words, or concatenated words, alone: bots also try these. · Moreover using common text-to-digit translations, like “LOVE” to “L0V3”, is not secure: bots also try these! So, both cities are amazing! A couple of months ago I decided to finally jump to another life, to another city. In these days, my last few days in Barcelona, I’m experiencing an hurricane of emotions, regarding things to leave and things to discover. And the most important: people. I arrived to Barcelona 7 years ago, as a bridge to Europe. My plan was spend a year or two in this city, and then move to some city in Europe, like London or Maastrich. But the feeling of this magic city hugged me. And here I am, 7 years later. But finally I decided to give a try to another city. A city that is not in Europe, but in Asia. Seoul, a city with Soul! It’s funny to see how I arrived to this situation. Like in a Go game, you make some moves, and life answer with other moves, so later you try to make new moves using your past moves as well as you can. These days I’m writing my testament for my Barcelona life. I’m giving this chair to Jordi, the microwave to Oscar, the Amelie poster to Ricard, some Go books to Joan, the barbecue to César, the whiteboard to Ramón, the closet to Alex, etc. It’s like I’m splitting myself into a thousand pieces, and spreading them among the people who are truly my great friends. It’s like a funeral, but with a smile. Sad but happy. My stuff will live in my friends’ houses. And, of course, I’d like to meet you all in my future new house in Asia! 안녕! Sometimes you can feel both love and hate for something. It happens to me with Mexico DF. I’m again in this crazy city, exactly 2 years later of my first stay. This city is really noisy. The perfect definition of chaos. Traffic lights are considered only a suggestion. And the air can’t be called “air” at all. This air is so so polluted: just imagine a city with 20 million people, 50 Km wide, with cars everywhere, and only a big park. A city at 2600m above the sea level (that is, less air density), in a closed valley, where it almost never rains (so there is no way to clean the dry air). You really have problems breathing. In my first stay my nose even bled. And you can barely see plants on the balconies. On the other hand, the food is good and cheap. If you don’t care missing fish, however. 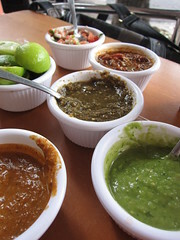 But after some days eating tacos and quesadillas, you will stop eating in the street places, and look for a decent restaurant. Also, people are really friendly. Always trying to smile and joke. So, somehow this contrast, crazy city but friendly people, forces me to look with different eyes. If people can be happy in this disaster of city, it should be not that disaster, but just “different”. If you start looking at the city with different eyes, with a curious innocence, you will start seeing beautiful things all around. Breaking concepts in your mind. Making your vision of things more flexible. Why do we need a house? When we start in this world, we live in our parents’ house, and later when we grow up, we try to find our own house. A place to sleep and to keep all your stuff. Is this a social need or it comes in our genes? When I lived with my parents, my personal space was my room, and some other corners of the house. Later I moved to Barcelona, and shared a flat with other people. My house was actually my room, but my flatmates didn’t respect my space, and I have to move to another place. Then I was the rent-owner, and other people came to live in “my” house. All my stuff was in different rooms. I also moved to another house, with all my stuff (including furniture) and lived alone. Is your stuff what defines your house? Meanwhile I travelled quite a lot, and slept in a lot of different places, from somebody’s high status house to a tent in the jungle. And I felt those places, most of them, as my house. Is a house the place were you sleep? Finally, I enjoy a lot having visitors in my house. So perhaps a house is the place where you have your stuff, where you sleep and where you host other people. · Can you put all your stuff in a single suitcase? Then your house can travel with you easily. · Can you sleep in any place? Then your house can be any place in the world. · Can you welcome a visitor, and show him/her the city, even staying in a hotel? Then you can feel any city as your hometown. These days I’m getting a lot of chances to travel and live around the world. From Mexico to Argentina, from Hungary to Korea. And despite I love my house with my beautiful terrace, sometimes I think that my house weighs down my flying spirit. 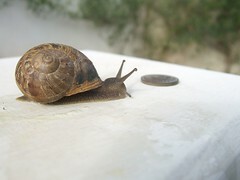 I envy the snails, who travel with a house, but having a camper is not the solution. The solution is to lose weight, to find ways to have less stuff, or to keep it in cheap places. And then, fly! 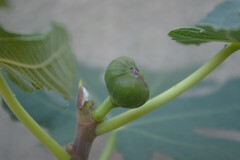 I live in front of a mountain, and there are some fig trees. When I walk around, in spring and autumn, I can enjoy the fragrance they blow in the air. Actually, fig trees’ smell is neither strong nor delicious. But the subtle smell reminds me, somehow, of my childhood, and a good reason to live. When I was child, I used to play in my grandfather’s backyard, where there were two fig trees and some palm trees. My grandfather was a self-taught, that learned several languages, maths, physics, etc from books, in a time without internet and libraries. He used to teach me a lot of things. And I remember one day, he said: “I learned a lot, and I wish there was a way to put all this knowledge in your brain, even if I die just after the process”. Some years later, I was the one who wish there was a way to give my young body to him. He got cancer, and little by little his body and mind turned off. One day, he barely could move away from bed, and thought about suicide. He told me: “I can’t enjoy the trees any more, I can’t go to the country side, I can’t go outside…”. Luckily, for the family and him, he passed away just some days later. Perhaps the most important life lesson he taught me was just: enjoy the trees. Like the subtle smell of the fig trees. Or seeing how the branches change when I walk around a tree. Or listening to my cousin, gardener, explaining me how my fig tree is developing new branches in some places, to balance the weight of the main trunk. Nature is wonderful, as life is. Another trip to Korea. This time I used my Easter holidays, and a kind host invitation of a Korean friend, to travel again to the land of kimchi. I stayed 9 days in Seoul, but this time just to enjoy the city and the friends, instead of studying Go and working during the mornings. I’m starting to think that Seoul is one of my favourite cities. Actually, regarding Flickr’s statistics, I have already more pictures of Seoul than Barcelona, despite I’ve been living in Seoul just 2 months, and 6 years in Barcelona. Some months ago I started to think about moving to another city, and this one can be a great candidate. Actually, if you join a Korean language course in any university of Seoul, they arrange all that you need: house, visa, etc. So I could go there, work in the mornings and learn Korean in the evenings. – Supermarkets have old boxes for free. Next to the exit of the supermarkets, they leave all those original boxes that were used to carry the products from distributors to the supermarket. So buyers can re-use those boxes, for free. There is even adhesive tape for free. It’s the best 2nd R (of the 3 “R” about recycling) I’ve seen in long time. – The public transportation is really efficient. The subway and bus are not the cheapest I’ve seen, but the transportation grid is pretty impressive: lots of subway and bus lines, that take you to any place around the city. Of course, the city suffers of traffic jams, but if you know that all trains and buses have WiFi, will you take the car often? – People really care about recycling. I hate watching my neighbours in Barcelona throwing big bags of trash, without doing any recycling at all. In Seoul all people does recycling, young but also old people. Depending the neighbourhood, sometimes the laws about it are really restrictive, for example, you can’t throw any plastic bag into the organic container (thing that makes sense). The sometimes sad thing is that old people, who don’t get enough pension money, use to collect and carry old boxes for getting some money when recycling. – The city is covered with nice mountains. In Barcelona I live close to Montjuïc, but I feel this mountain has too much concrete. In Seoul mountains are real mountains, where you can get lost. They really keep those natural spaces! Of course, that doesn’t mean Seoul is a green city. It’s not really bicycle friendly, for example. But some ideas are interesting enough to try to import. A new year started. A new time to fill will feelings and experiences. I wondered where I will travel this year. Thinking about travelling, I imagined myself going again to the jungle, or at least some stunning natural place. Visiting old ruins. The world is wide, and I have no preferences. Well, it’s funny to see I’ve barely visited places in Spain. And, despite I’ve been in Costa Rica twice, I’ve not visited any natural world heritage there (perhaps because those places are really inaccessible, like Cocos Island). I should pick one country and visit all the places in this list. This would be a nice trip. Don’t you think so?